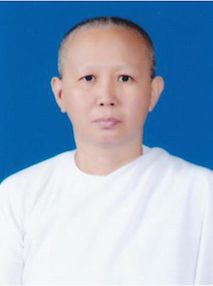 Maechee Aun-Ampai Passakchai is the Assistant Secretary of the Thai Nuns’ Institute; Director of Dharma Jarini High School, Elementary School and Sunday Dharma School; Secretary General of the Dharma Jarini High School Foundation under Royal Patronage, and a Committee Member of the Provincial Child Development Board. Maechee Aun-Ampai Passakchai was born in Sena District, Ayutthaya, Thailand. Her education is a M.A. in Educational Management and Dharmasuksa Aek. In 1978, she was affiliated with Wat Paknam Pasicharoen in Bangkok. In 1990 until present was worked at the Pak Thor Nuns’ Institute in Ratchburi, Thailand. The objective of her work is to assist young women. Young women are future mothers. The quality of young women’s lives plays an important role in the country’s future development. At present social problems affect the well-being of girls, with increasing violence. Many young women face difficulties, live in poverty, in broken families, or are orphans. They lack opportunities for education to develop their quality of life. Many become victims to social ills such as being beguiled, violated, involved in narcotics, unwanted pregnancies leading to abortions, AIDS, etc. This becomes an important social problem, which needs to be addressed in all sectors of the country. So, the Dharma Jarini Project was set up to help young women receive equal opportunity in education and to study Dharma for development and rehabilitation. Concept and work method: In 2546, set up Dharma Jarini Wittaya School, which is a welfare school, affiliated with a private committee to promote education. The aim is to help disadvantaged young women in the high risk group receive equal opportunity for education, with 3 objectives: 1. An opportunity for education and a new life. 2. Build inner strength through morals and ethics. 3. Build outer strength through vocational training, so a student gets a new life, is a good person, competent, can live happily in society, and is self-sufficient. Buddhist Principles and rites used as guidelines: Buddhist Principles: Suppurisadharm 7 (deportment), Sangkha Wattu 4 (deportment), and Ittibaht 4 (work). Rites: through prayer and meditation mornings & evenings. Activities in missionary and development work (past and present): Setting up Dharmma Jarini Wittaya School to help disadvantaged young women to get an equal opportunity for education, instill moral and knowledge, so they can become good citizens. For the moral and ethics programme, the school organized activities to rehabilitate young women in the programme. There are dharma studies – BA, MA & PhD. Through the Sunday Buddhist School of prayers and morning and evening meditations. On important Buddhist days, practice Buddhist Precepts, pray, candle light ceremony, build “Moral Trees” through ordination of young nuns on a voluntary basis, voluntary work for the good of society, activities to promote prayers Sorapanya and prayers into English. Future plans for missionary and development work: Set up a second branch of Dharma Jarini High School in the north to help disadvantaged, young hill tribe women have access to education, both religious and secular. Effect of missionary and development work on the local community: The school’s activities are well received by the local community in Pak Thor District, Ratchburi. Locals want to send their kids to the school from a young age, so they are exposed to morals and ethics, and have strong minds. Thoughts for women working in missionary and development work: The work should contribute to spiritual development, not only materialistic or worldly matters. Our work should be used as a tool to refine ourselves, by working without clinging to it. Work to enjoy, have fun while working, so our minds are not sad.